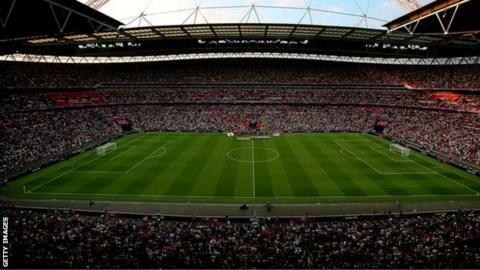 England are to face Brazil and the Republic of Ireland at Wembley, the Football Association has announced. Five-times World Cup winners Brazil will visit as part of the FA's 150th anniversary celebrations on 6 February 2013, with England heading to Brazil for a two-game tour four months later. The friendly with the Republic of Ireland will take place on 29 May. England have not played Ireland since the 1995 clash at Lansdowne Road was abandoned because of crowd trouble. The two sides will also meet in a second match a year later in Dublin, with the fixture provisionally scheduled for November 2014 at the Aviva Stadium. "2013 is a landmark year for the FA and an exciting England fixture programme, in addition to Wembley hosting the Uefa Champions League final, will form a key part of the celebrations," said Club England managaing director Adrian Bevington. Due to the FA's fixture arrangements, England do not play any World Cup qualifiers at the end of the season. The high-profile fixtures with Brazil and the Republic of Ireland are in keeping with the rest of their 150th anniversary celebrations. A match against Scotland has already been confirmed for 14 August 2013 at Wembley, with another fixture planned - possibly against Uruguay - next summer.